Going to London is nothing new, i go quite a few times a year to see friends and attend events for my blog but it's rare i get to take time out to be a 'propa' tourist. I was gifted some tickets for Viva Forever and i thought it would be really nice to go with Mumma Price and spend the day together. I had planned to take my camera and get happy snappy but of course i left my memory card in my laptop, opps. After a having a panic about tickets (my fault entirely after leaving my bank card in my Dads car) we hopped on a train at our local station and an hour and half later we were at Kings Cross station where i finally got to see Platform 9 3/4. My Mum and Dad are originally from London but moved to Leicestershire just before i was born so it was really nice to see where my Mum used to work when she was my age (which was literally right next to Piccadilly Theatre) and where she used to go for her lunch in a cafe just a round the corner. We headed to Carnaby street as i wanted to pay a visit to Monki (left with nothing!) and spent money we didn't have in Liberty. Dinner was at Byron burger (thanks Gemma!) and then a quick drink before the show itself which by the way was so cheesy it was sometimes embarrassing but fantastic none the less! Home at 1.30am and then back to work the next day. It was such a lovely day and it's made me even more (if that's possible) excited for New York in 4 weeks! Looks like so much fun! Wish I could visit one day! I really want to go and see Viva Forever! Hi Victoria! Fabulous post, I love days like this! I was wondering if you had a spare minute would you mind taking part in my questionnaire for my dissertation? It is aimed at all UK fashion bloggers; so if anyone who fits that category would't mind helping me out I would be very grateful!! Love when I have the chance to be a tourist in London, I can never resist a snap of the London Eye! I do love having a run around London. Always try and visit somewhere new when I'm there. Only live about 45 mins away so it's fab getting the train in and seeing it, then escaping before I get too stressed. I really like New York but London is x10 better in my opinion! Aww it all looks amazing, I'd love to visit London, glad you and your mamma enjoyed viva forever! Looks like had an amazing time, such nice pictures! 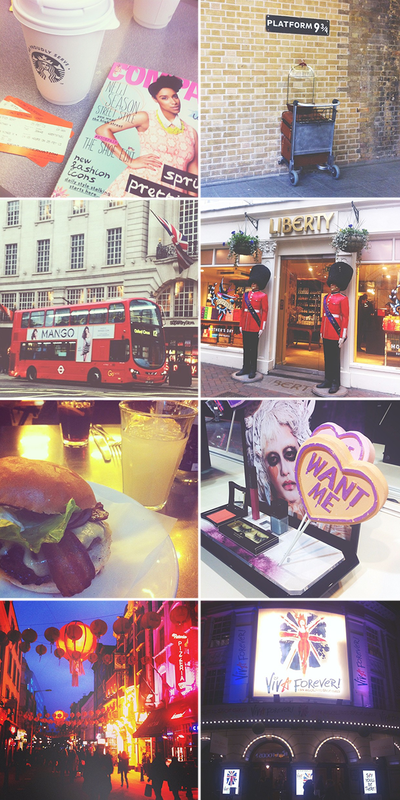 Lovely pictures, I need to go back to London ASAP! Aww looks brill - Hope you had an awesome time! Looks like you had fun, your pics are great and that burger looks AMAZING! Mmmm, that burger looks divine!! I love love touring in London. So muvh happens there that wat happens in the entire Sweden. I want to go to Byron Burger too! Liberty is gorgeous, I could spend all day in there!